Economics Student and … Writing Consultant! 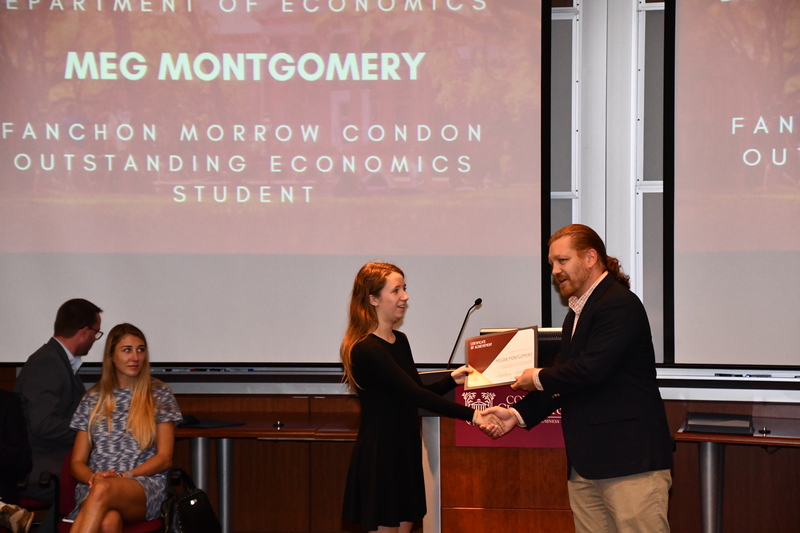 Amelia Janaskie (’20) is not just an economics student. She is also an English minor, and works for the College’s Writing Lab helping students polish their prose. 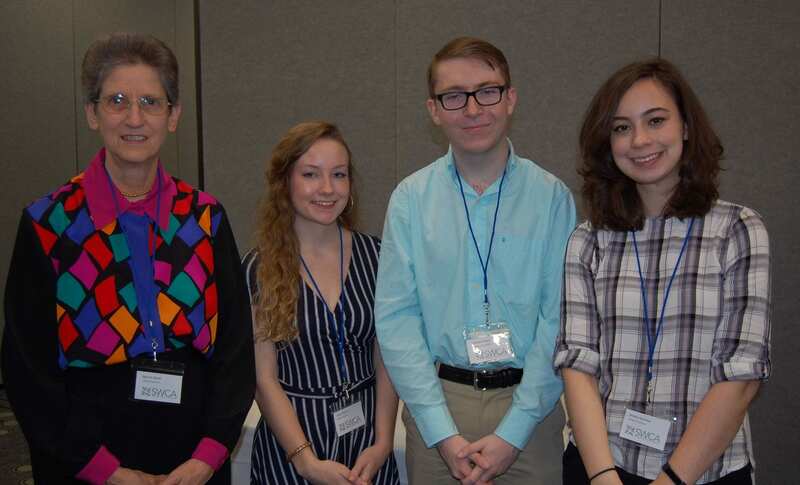 On February 22, Amelia, along with fellow consultants Cassy Frierson and Chase Myers, and Writing Lab Director Bonnie Devet, participated in the Southeastern Writing Center Association Conference in Myrtle Beach. 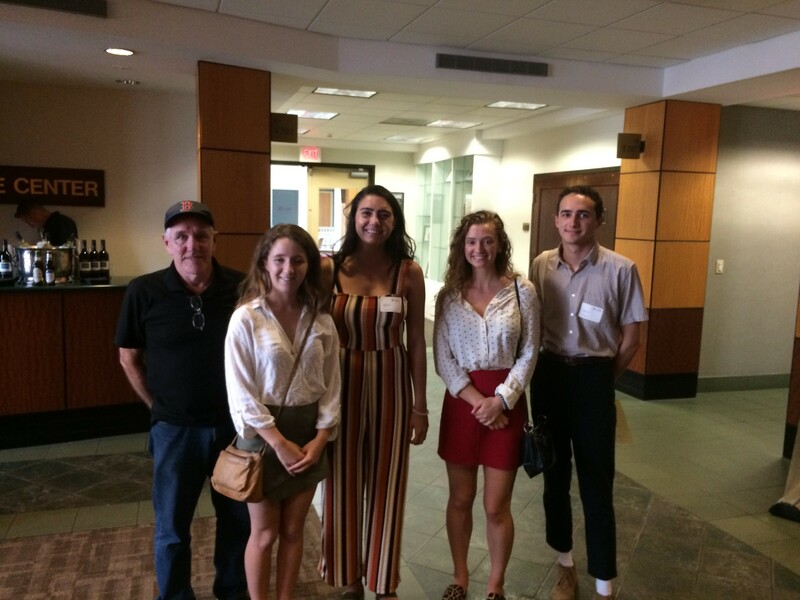 The four representatives from the College discussed “Has a Writing Client Ever … Reflection Cycle for Training.” We’re very proud of Amelia! 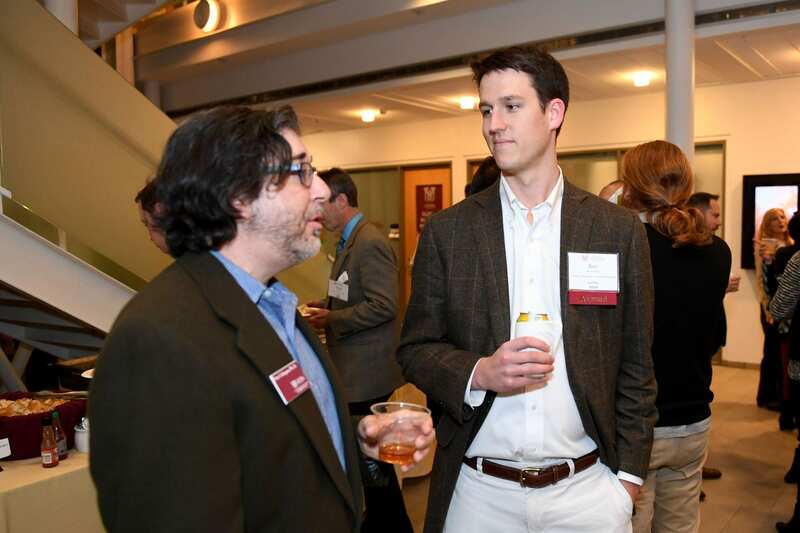 Several Economics Alums and Faculty attended the Business over Bourbon event on November 16. Good food, great bourbon and great friends made for a wonderful event. A recent Wall Street Journal article highlights Assistant Professor Chris Mothorpe’s research estimating the economic damages due to power lines. Mothorpe and his colleague David Wyman published an academic article in which they calculated that properties located adjacent to transmission lines sell at a 45% discount. 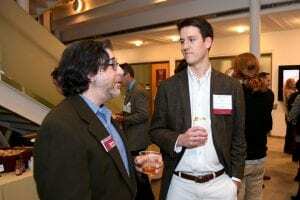 This past year the Center for Public Choice and Market Process celebrated its 10th anniversary. The Center’s director, Peter Calcagno, has done a wonderful job building the Center into an intellectual leader on the College campus. He has raised over $1 million over the last 10 years, and put that money to excellent use. Every year the Center sponsors Adam Smith Week, a celebration of economics. During this event, the Center has hosted numerous prominent economists, including Nobel prize winner Vernon Smith. The Center organizes other talks throughout the academic year, including those given by superstar academics like Deidre McCloskey and Richard Epstein. Unsurprisingly these talks are popular – this past year over 1000 students attended talks hosted by the Center! A major part of the Center’s mission is to support undergraduate education and research. From the beginning, the Center has sponsored a Book Colloquium, in which students meet in a small group with select faculty to discuss current writing in economics. In addition, the Center now provides scholarships to its Market Process Scholars, who are expected to work with faculty on research. The Center has also provided direct support to faculty in Economics, Political Science, Philosophy and Religious Studies. Fourteen papers and two books have been published with support from the Center. The Center has been a terrific resource for the students and faculty in the Economics program for the last ten years. We look forward to more success in the future. Dr. Beatriz Maldonado is an Associate Professor of Economics and International Studies. She is originally from San Juan, Puerto Rico and later moved to Oklahoma. She earned her Bachelor’s, Master’s, and Ph.D. in Economics at the University of Oklahoma. Her research in economic development and political economics has appeared in the European Journal of Political Economy, Oxford Development Studies, Applied Economics Letters, and Social Science Quarterly. She has worked with students on research topics in political economy and development. Recently, one of those research projects with Alumni Schylar Brock was published in Economics and Business Letters. Dr. Maldonado teaches Macroeconomics, Economics of Globalization, and Economic Development. Every spring semester, in conjunction with the Department of Economics, the Center for Public Choice and Market Process puts on Adam Smith Week. Through a variety of events, the week is a way to engage students, faculty, alumni and the community in a conversation on the ideas of Adam Smith and economics in general. For more information on Adam Smith Week, visit http://sb.cofc.edu/centers/publicchoice/programs-and-events/adam-smith-week/index.php. 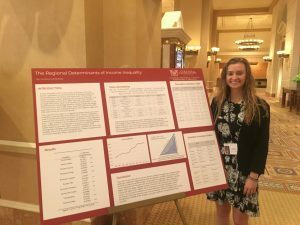 Graduating Seniors Caroline Carmichael and Meg Montgomery each made presentations at this year’s Association of Private Enterprise Education in Las Vegas. On April 2, 2018, both Meg and Caroline presented their posters at a special session focusing on undergraduate research. Caroline’s presented work on income inequality. 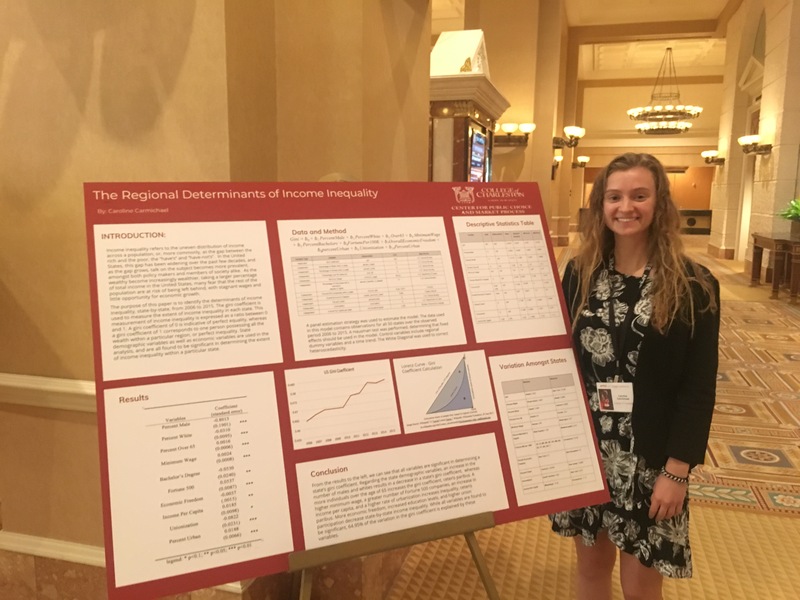 In her poster, “The Regional Determinants of Income Inequality,” she showed that a number of factors significantly impact income inequality at the state level. In particular, more economic freedom, increased education and higher union participation rates all seem to reduce income inequality. 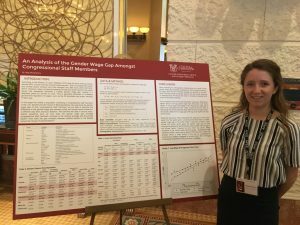 Meg’s research project, “An Analysis of the Gender Wage Gap Amongst Congressional Staff Members,” formed the basis of her Bachelor’s Essay for the Honors College. In her research, she found that women Congressional staffers suffered from a larger pay gap than the 2017 national average, and that this gap was larger for women working in Republican legislator’s offices. Congratulations to Meg and Caroline for presenting their hard work! 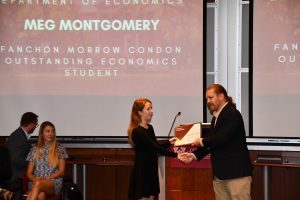 This year’s winner of the Fanchon Morrow Condon Memorial Award/Outstanding Economics Student is Meg Montgomery. Meg is a Presidential Scholar graduating from the Honors College with a degree in Economics and minors in Data Science and Philosophy. She has been in the Center for Public Choice & Market Process Market Process Scholar program for two years. She has had the opportunity to work on various research projects and has presented her research on the Gender Wage Gap in Congress at the Association of Private Enterprise Education Undergraduate Poster Session, and William Moore Undergraduate Research Conference. She is the captain of the Women’s College of Charleston Ultimate Frisbee team and enjoys photography.